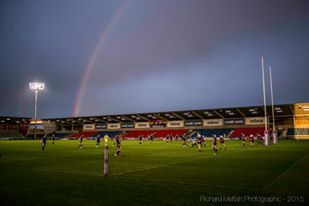 HUNDREDS of fans were in attendance as Salford Red Devils Foundation hosted the eighth annual ‘Two Cities’ Varsity fixture between University of Salford and University of Manchester at AJ Bell Stadium on Monday night. Fellow students, former players and other friends from the world of rugby came out to show their support for both teams as Manchester came from behind to win 22-14 and take the title for a second consecutive year. 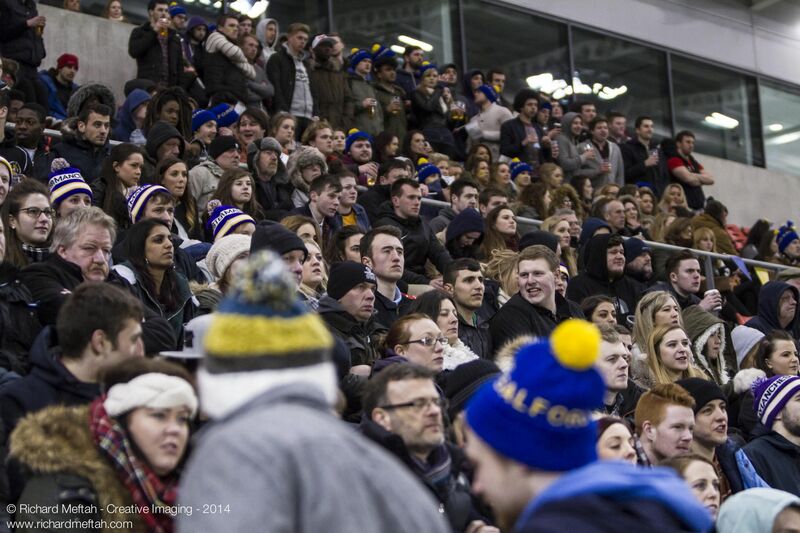 The event, considered by many as one of the largest student sporting events in the North of England, has fast become one of the highlights of our community calendar and traditionally brings an end to both club’s academic year. This year’s victory marks a high point in what has been a difficult season on the pitch for Manchester, whilst Salford still have much to celebrate despite defeat having won their BUCS league title and reached a cup final in recent weeks. Elliot Pratt has been a key cog in Salford’s side this season, and despite the disappointment at not being able to finish the season with another win, he highlighted the importance of the continuous work and effort that is put into the community to allow such events to take place. “It was great to play in the stadium, especially for the lads that have never had the chance to be involved in such an occasion and it really gave a professional feel to everything,” he said. “I think it helps with the overall promotion of university and amateur sport knowing that players and fans still have the chance to be involved in big occasions such as this. It’s something we’ve looked forward to all year. Pratt’s side looked on course to make amends for last year’s defeat when Adam Davies went over with the first try of the game on eight minutes, but Shae-Lyon Fraser responded five minutes later. Salford then regained the lead thanks to Ash Warne’s effort, making it 10-6 going into half-time, before Mike Quickenden’s try four minutes after the restart extended the lead further. Manchester rallied though and brought the score back to within two just minutes later thanks to Matt Mackintosh, before John Rowe’s try reversed the margin to 16-14 in his side’s favour. Mackintosh’s second try then extended Manchester’s lead to eight, before a disciplined closing 15 minutes ensured Salford would not strike back again. Danny Doherty, Projects Support Officer at Salford Red Devils Foundation praised both sides efforts following the game. “Both sets of players were fully committed to the game,” he said. For some of those players, greater things in the game could now beckon, with Gloucestershire All-Gods’ Alex Davidson and Rochdale Hornets’ Samir Tahroui among those to have used the event as a stepping stone to professional rugby league. But for others, the mere opportunity of inclusion and health-related activity in the local area remains just as important, as Doherty went on to add. “Opportunities such as this are very important to us as they allow us to engage with more of the community. Back-to-back successes means Manchester now trail Salford 5-3 in the overall series, setting up what is sure to be another competitive and eagerly-awaited encounter next year. By Ashley Thornton-Jones. University of Salford MA Student.